I have a bunch of these sway bar links (part #2L2Z5K483BA) for sale at a very low price. I went to the Ford dealer to buy just the outer rubber bushing and they said all I could get was the complete link plus the bolt and nut at an outrageous price and I refused to pay it. After searching I found a package of 10 links at a much better price than the dealer wanted. I decided to buy them and offer the extras to anyone that wanted them. 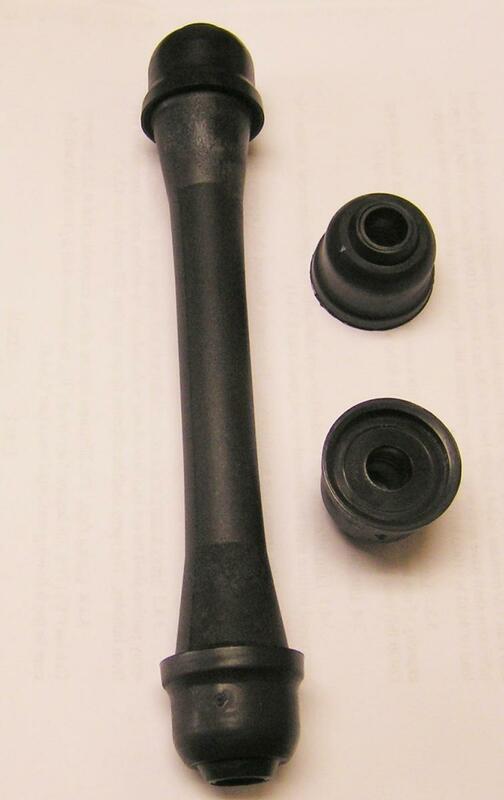 The list price with the plastic center piece and two outer rubber bushings is over $5.00. I will sell them for $1.00 each plus shipping. I show two extra rubber bushings in the picture to give more detail to make sure they will work for your application. The center plastic is about 5-3/4" long and 1-1/16" diameter on the end where the rubber bushings snap on. With the rubber bushings in place, the link measures 7-1/2" from tip to tip. These are genuine Motorcraft parts that you can buy from the dealer if they are willing to sell them to you. I have 8 complete links (1 center plastic piece and two outer rubber bushings) and 2 plastic center pieces without the rubber bushings. They do not include the bolt, nut nor any of the metal washers. I should mention these do not fit all Rangers. I know they fit my 02 FX4 front sway bar but I don't know what other Ranger they fit. Got new SL sway bar end links today! Upgrade sway bar end links?